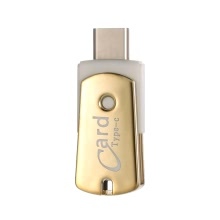 2-in-1 Type-C card reader has USB3.1 Type-C and USB2.0. It’s a good way to provide extra storage for smart phones like for Letv pro, for Letv MAX, for Xiaomi 4C, tablets, PCs and for Mac computers with Type-C interface, solving the problems of shortage of memory. It provides you a convenient way to access data to for New MacBook , PC with Type C port or Micro SD on traditional USB devices. Super speed USB 2.0 card reader and USB 3.1 Speeds up to 140 MB/s. Fast speed for downloading files like movies, music, documents, etc. Support Micro SD card up to 128G(TF card is not included). Rotatable and hidden Micro SD card reader is plug and play. No driver needed. Reversible connector allows you to insert it front and back, always in a right way.